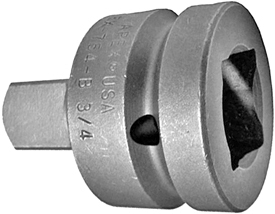 Apex® 1'' square drive adapters, 3/4'' to 1-1/2'' male square drive from Cooper Tools. Apex® square drive adapters have hex tolerances that are on average 48% tighter than DIN and 35% tighter than ANSI requirements. With Apex® you are assured of an exact, sure fit. All Apex® square drive adapters have the tightest tolerances for straightness and concentricity in the industry.